It’s not always easy to take a honeymoon right after a wedding. The expense can be prohibitive, and sometimes life just gets in the way. 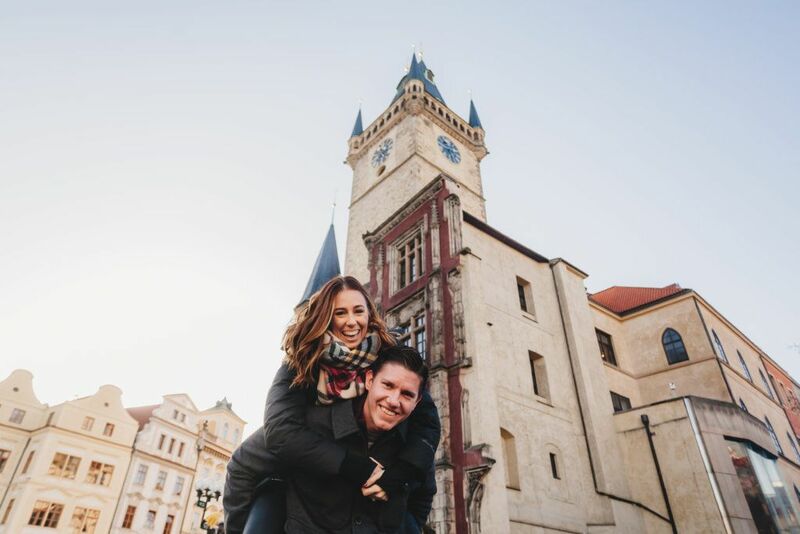 So when Jessica and her husband were finally able to take their honeymoon in Prague over a year after they were married, they wanted to make sure they captured it perfectly. Prague is the capital of the Czech Republic, and is known as the “city of one hundred spires” for all of its fantastic Gothic churches. Iconic symbols of Prague include the Charles Bridge, which is often crowded with artists and tourists, especially in the summer, and the beautiful hilltop castle keeping watch over the city. The Old Town Square is one of Europe’s largest, and the Astronomical Clock is a draw for visitors every hour. It is the third oldest astronomical clock in the world, and the oldest still in operation. The city’s maze of cobbled streets and hidden courtyards make for a perfect day of wandering, topped off by one of Prague’s famous exports: beer. To celebrate their (belated) honeymoon, Jessica wanted to have some good, professional photographs done, so she hired Ivan, a vacation photographer. Ivan suggested a number of sites in Prague to show the couple at its best, but also to showcase Prague and its architecture. 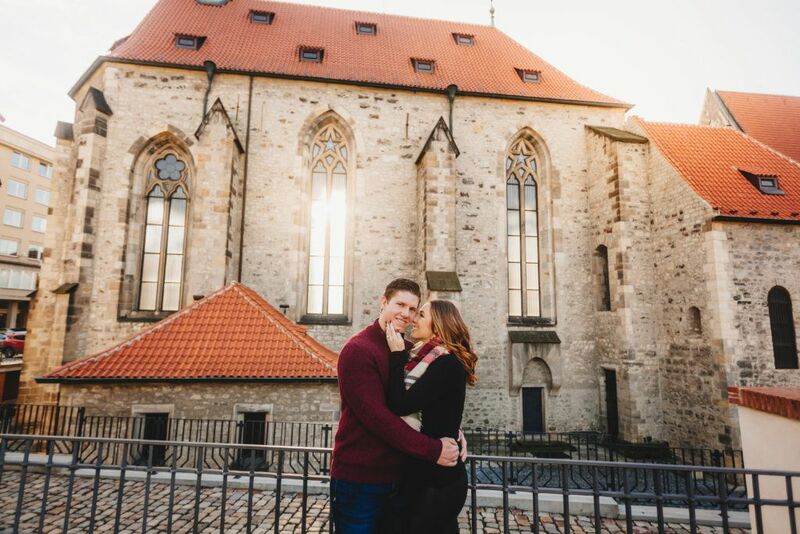 From the rust-red roof tiles to an intricately carved doorway, Ivan used Prague’s Gothic ecclesiastical architecture as the perfect background for his images of Jessica and her husband. 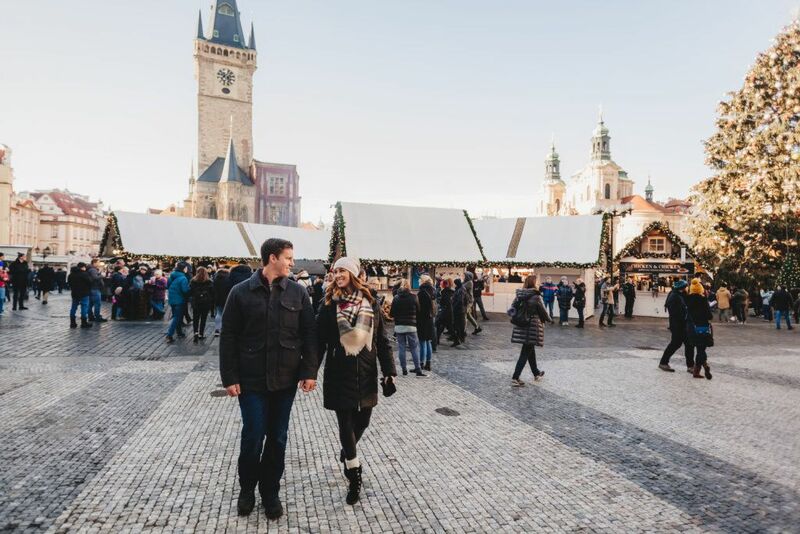 He finished the shoot with the couple standing in a park, the twin Gothic turrets of the Tyn Church in the Old Town Square rising behind them. These images are especially nice as the city’s Christmas lights were still up, and on, giving a sort of fairy-like sparkle to the scene. 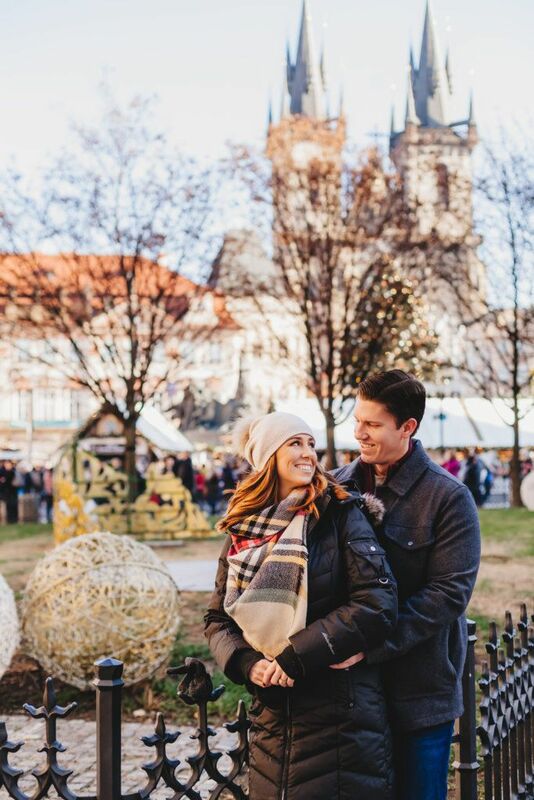 Although winter in Europe is often grey and damp, the sun was out in Prague this day, and Ivan used it to his full advantage to take some truly terrific photos of the happy couple. The bond between Jessica and her new husband is obvious. Their spirits really shine through in these images, and their smiles tell the entire story. When vacationing together, it can be really hard to take the perfect images without one person missing, or resorting to a selfie stick. So it is wonderful to be able to see a couple’s connection through the use of a high quality professional vacation photographer like Ivan. The photographs are from several vantages and in many poses, none of which feel stiff or overly posed. Ivan made certain that Jessica and her husband were comfortable in their surroundings, and with the images. None of the photographs are intrusive or invasive; they are warm and even playful. Fulfilling their honeymoon wish, Ivan was able to let the couple simply be together in the moment, enjoying each other’s company, while photographing their obvious love for each other.